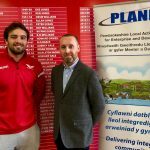 PLANED, the Pembrokeshire Local Action Network for Enterprise and Development is pleased to announce that it has entered into an arrangement with Scarlets Rugby, as part of a drive to increase the reach and awareness of outputs and delivery of projects. Promoting Pembrokeshire and West Wales is a key cornerstone of PLANED, being able to sponsor the Pembrokeshire raised player Josh Macleod forms part of that promotion. Raised in Fishguard and a former pupil of Ysgol Bro Gwaun in Fishguard, Josh has been capped for Wales at both under 16 and under 20 level, and now plays for the Scarlets as a formidable back row forward, capable of playing anywhere across the back of the scrum. For more details on PLANED projects please visit our projects.